"This is a moment of reckoning for our elected leaders." Yesterday afternoon, U.S. Representative Joe Crowley came out against protected bike lanes and pedestrian safety upgrades for Skillman and 43rd avenues, claiming to speak for “the community.” A few hours later, more than 100 members of the community put their bodies on the line to show support for the project. 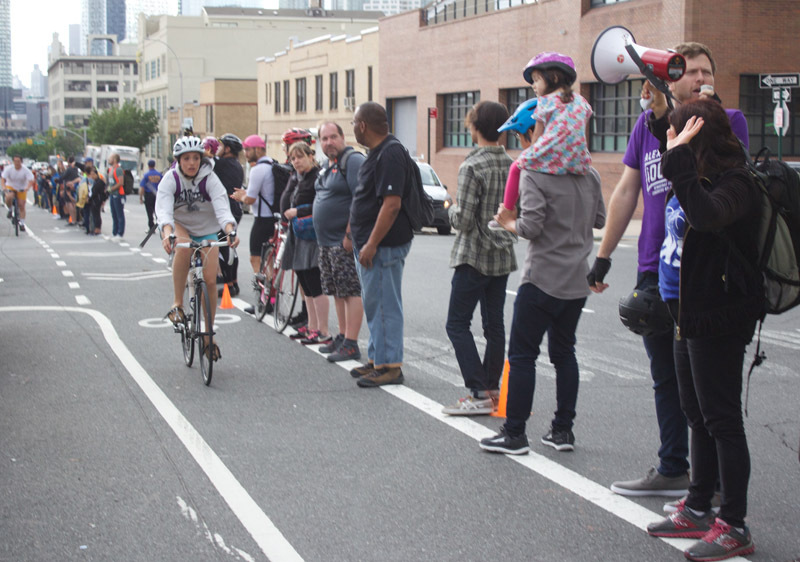 Participants formed a human chain on 43rd Avenue, separating the street’s painted bike lane from moving traffic and protecting people biking to their homes in Queens after work. A protected bike lane could have saved the life of Gelacio Reyes, who was struck and killed by a motorist last spring as he was biking home on 43rd Avenue at 39th Street. Ten days later, a driver critically injured cyclist David Nunes at the same location. 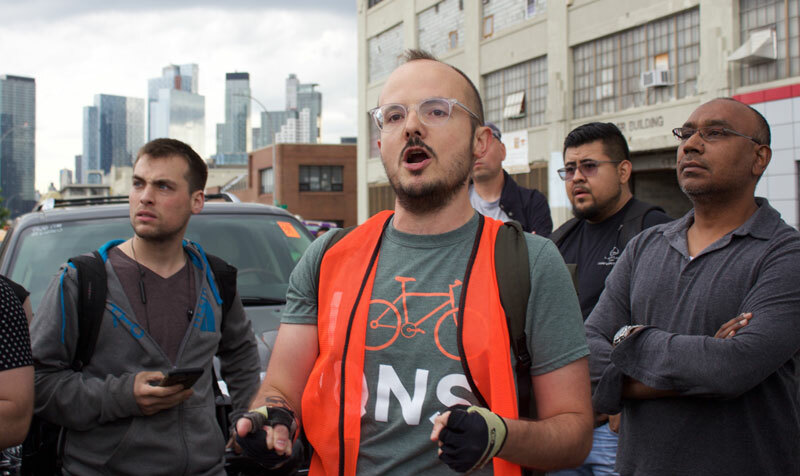 The protected bike lane plan was first presented by DOT in November, but it’s been delayed in the face of merchant opposition to repurposing parking spots, with Council Member Jimmy Van Bramer sitting on the fence. The “human-protected bike lane” was a final demonstration of why these street safety upgrades matter to Queens residents before a critical vote on the plan coming up at Community Board 2 tonight. “How many lives is a parking spot worth?” went the chants, while passing cyclists smiled and cheered. The CB 2 transportation committee voted 5-2 vote in support on Monday. The plan has been reworked several times in response to complaints about safe intersection treatments that remove parking spaces for cars, but board chair Denise Keehan-Smith remains opposed to the current version. For residents of many Queens neighborhoods, 43rd and Skillman are critical bike connections to and from the Queensboro Bridge. They came out to show that despite what Joe Crowley says, people in the community want protected bike lanes on these streets. During the demonstration, people on bikes often outnumbered people driving, who were scarce even during peak p.m. commute hours. Geraldo Diaz commutes by bike from Corona to work at a restaurant in Long Island City along Skillman and 43rd. He’s been injured by a driver who doored him on Roosevelt Avenue and constantly worries about the risk of another dooring collision, which protected bike lanes would eliminate. Keisuke Inoue spoke about the need for safe bike lanes — for him and his young daughter Ena, who was seated on the back of his bike, as she often is on her way to and from daycare. Several people noted the fatal crash on 21st Street in Long Island City last week, caused by a driver who opened her door without looking and knocked cyclist Aaron Padwee into the path of an unlicensed box truck driver. Eric Auerdach bikes to his job at the JetBlue building in Long Island City from Bed-Stuy every day. After Padwee’s death, he felt it was important to come out and increase awareness of the need for a protected bike network. Conrad Gangone, a Woodsider who rides on Skillman and 43rd Avenues almost every day, came out because he routinely has to weave around parked cars and has been hit by turning drivers. “I’m hoping that people notice that we’re here, and with the transportation committee vote the other day, I hope the full board approves this,” he said. I can’t help but notice how this “human protection” forced cyclists to ride in the door zone. Give me a break. It was a short demonstration and surely anyone who was in their car and wanted to get out would have been well aware of what was going on. Your broader point is a good one; bike lanes are too narrow! Besides all the data, there are some great testimonials in this article as to why pedestrian and bicycle improvements must be made to this vital stretch of Western Queens streets. Last night’s action was a great account of the community’s desire for safer streets. Let’s make it happen, Queens CB2 / JVB / de Blasio! That so often seems to be the excuse, doesn’t it? Deal with it, cyclists! We’re advocating here! It was a political demonstration for protected bike lanes – not for thicker paint. Next you’re going to tell me that all the people standing in the street last night could have been hit by a car! That is always my fear at one of these. Great testimonials for one side, anyway. I bike through here all the time, and I’m far more ambivalent about the lanes. Will they make the road calmer and safer for pedestrians? I think so, yes. Will they protect cyclists? I’m far less certain about this. You don’t eliminate dooring risk with protected lanes – you just shift the risk and lessen its consequences – and I always feel more likely to be hooked in a parking-protected lane than I do in a paint-buffered one. A lot of the appeal of protected bike lanes in this city strikes me as little more than “security theater,” whose demonstrated benefits derive less from smart design than they do convincing more people to bike and thereby shift driver expectations. I think the main place where protection will help is along the rail yard, where right now cycling carries multiple risks from multiple directions. I think the proposed design there helps at least WB cyclists. As usual for the NYCDOT, it’s a mess for EB cyclists. So it’s hard for me to get excited about the lanes here. If they go in, I’ll give them a try, but I fully expect to alter at least part of my route to avoid them. Please recognize that you’re an outlier and that we all benefit when there are a lot more people on the road. I know you’re a “vehicular cyclist” and I used to be one too. I remember commuting from UES to FiDi before any of the Bloomberg era bike lanes were built. And while I rarely feared for my safety in any meaningful sense — I also recognized that one slip of my foot from the pedal could’ve seen me get run over by a box truck and game over. I don’t mean to suggest otherwise. I recognize the fact – and as far as I know there’s data on this – that more cyclists = safer cycling. And so the strategy of building out infrastructure that maybe doesn’t deal with the actual risks cyclists face (are we more at risk from drunk driving or right hooks?) but looks like it does has an indirect, safety-improving effect for the cyclist population generally. But those rosy statistics obscure a gritty reality. I go from a situation where I know and can handle the risks to one where my body is in the crosshairs of half-assed design. Can’t help but notice you’re critiquing other people’s activism from a safe distance, as usual. Yeah, I’m pretty ungrateful, aren’t I? Getting more people to bike isn’t security theater. It results in the well documented safety in numbers phenomenon that makes cycling safer for everyone. You do you. The rest of the 95% who have no wish or optoin to engage in your world of ‘vehicular cycling’ will do us. It’s unfortunate that only advocates showed up to protect the bike lane. If only there were some community members in that photo. Count me as a former VC (that’s how I learned to ride at least) who just can’t handle that stress anymore. I’m hopeful that the infrastructure, such as it is, addresses the latent demand for cycling and will one day catch up to best practices such as raised junctions, daylighted/protected intersections, etc. I much prefer physically-protected lanes to door-zone lanes, but no more mixing zones please! Is there a reason we can’t inspire people to bike more by building infrastructure that ACTUALLY makes them safer, instead of just giving them the impression that they are? Listen – any protected bike lane with mixing zones and turning car traffic without clear sight lines requires a certain level of experience to navigate safely. Just because a bunch of novice cyclists think they have to worry more about traffic traveling in a straight line doesn’t mean that designs catering to their inexperience are good ones. I am not sure how vehicular cycling got into this conversation except as the usual bugaboo that complete streeters love to trot out. Nothing that I’ve said is in praise of vehicular cycling. All I’ve said is that these designs create new headaches that will still require VC-level sophistication to navigate safely. Look at the design for EB cyclists trying to get to 43rd, for heaven’s sake! They expect cyclists to veer across multiple lanes of fast-moving traffic at an intersection without any traffic controls. Right now, people do that at Queens Boulevard, where they have the benefit of a light and clear sight lines. The whole plan is like that. I am sick of being lectured for pointing out patent flaws in designs that lull inexperienced cyclists into a false sense of security. It really makes me wonder how much time any of these advocates spend actually riding the streets. Many of these designs replace occasional terrifying experiences with daily close calls. By which you mean, I guess, you’ll take the subway. No. I’ll be riding with my kid to ballet very thankful that there is a bike lane – despite all its failings. You and I are strong bikers who have no problem acting like a car. WE are the 5%. Don’t forget that. What did I ever say to suggest that I was unaware that I was part of a minority of experienced, strong cyclists? No, listen – this has nothing to do with vehicular cycling. This has everything to do with building infrastructure that inexperienced cyclists perceive as “safe” but do not know how to use in a way that furthers their own safety. They ride into hazards they don’t know how to spot and/or, worse, they develop habits for dealing with them that frustrate the design. You ride your kid to ballet in a bike lane. That’s great! I’m glad that whatever lanes you’re using feel safe enough for you to do that. But I would feel nervous as hell if I saw one of those parents carting their young child in the front of a Citibike down Second Avenue’s bike lane. Or down one of those bike lanes that veers in a counter-intuitive detour suddenly to accommodate through car traffic and parking. I mean, take a roll NB up Vernon Boulevard sometime (to get to Astoria Park!) and tell me what you think a novice cyclist is going to do in (i) downtown LIC, (ii) along the two bits where the lane “detours” through parks rather than continuing on the street, (iii) the bit by Costco, and (iv) where the lane finally ends. Never mind all the truck parking – I’m just talking about how it’s designed! Maybe you should ask yourself whether you feel sufficiently confident in the bike lanes you use precisely because you know how to ride in traffic when you have to, so the lanes’ gaps aren’t a problem for you. I agree with most of what you say. The major difference (and, please, correct me if I’m wrong) is that you feel any bicycle infrastructure which isn’t the gold standard in design and installation should not be build because of actual risk. I feel that anything a city does to give people the feeling that cyclists (and pedestrians) are being taken into account and provided infrastructure which increases participation is a good thing and an effective bridge to getting that gold standard. What is it about “building cycling infrastructure that doesn’t include death traps for unwary cyclists” that says, “gold standard,” to you? I agree, we have a long way to go before cycling infrastructure comes close to best practices. I still feel like any semi-protected infrastructure is an improvement over the status quo, though. I don’t know how I can be any clearer. This is not pie-in-the-sky, perfect-enemy-of-the-good idealism. I am not demanding curb-separated bikeways and continuous networks. I am just saying that your “semi-protected” is actually “protected, with hazards.” Imagine if the DOT installed nails, thumbtacks, and other sharp debris directly into the asphalt of a parking-protected bike lane every other block. Would you be condescending to me, when I point out how bad that design is, then? Then why would you, when the designs we get (I.e., mixing zones) require cyclists to behave almost exactly as though there was sharp debris in the asphalt? Parking protected bike lanes should have daylighting at turning conflicts, lanes should continue past turning lanes with at least bollard separation (rather than disappear as mixing zones), and intersections where turning drivers are expected to yield to through cycling traffic should be protected (so that drivers see cyclists in their forward vision, and not only through rear view mirrors). None of this is “gold standard” or “perfect” cycling infrastructure. It’s just how you design a lane so that novices don’t get hurt. how you design a lane so that novices don’t get hurt. I completely agree. I never intended to condescend. Please remove this obvious troll comment. I was sarcastically referencing the deplorable tendency to label anyone favoring bicycle infrastructure as an advocate and anyone opposed as a community member. Obviously everyone in that photo is a concerned community member. Crowley claims to be listening to the “community,” but plenty of his Sunnyside constituents want to see the redesign happen.